You may think your pooch will never stop acting like a pup but as your four-legged best friend gets older, he will eventually start to slow down as he reaches his senior years. From around the age of eight – that’s 56 in human years – your dog may need a change in his diet to help combat the inevitable signs of ageing and keep a youthful spring in his step. As they age, dogs are more prone to obesity as well as a range of health conditions, plus his activity level will gradually reduce, meaning his usual dog food may no longer be fit for the job. A daily diet tailored for the specific needs of a senior dog could well be the way to go. To help you make the diet switch so you can keep your older dog bright and sprightly, we look at the best senior dog foods currently available and the reasons why you should consider a change. As the old saying goes, ‘there’s plenty of life in the old dog yet’ and his diet could well make all the difference. 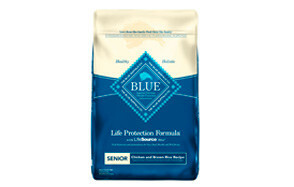 A quality all-round, balanced dog food for senior dogs, Blue Buffalo’s Life Protection Formula has been designed to nourish your pet and help keep him on the move. It is nicely packed with the protein and nutrients your dog needs, with added supplements for additional health reassurance. It uses chicken, whole grains and vegetables to create a delicious dry meal that will not irritate or slow down your pooch’s digestion. Added L-carnitine works to support strong muscles while glucosamine and chondroitin can help support joint, hip and overall mobility in your older dog if stiffness is a problem. As one of our best senior dog foods, we like this formula as it is easy to digest and is not packed with calories, making it a good meal for any over-weight pet, while the fiber helps to keep everything smooth running. It is also free from artificial flavors, preservatives or colors. If your old-timer is a little lackluster and down on energy levels, then his or her diet could do with a turbo-boost so they can get back some of their youthful bounce. Hill’s Science Diet specifically formulated for senior dogs could be the answer, with its carefully balanced mix of protein, nutrients, antioxidants, vitamins, minerals and healthy fats that will hopefully put more spring back into their step. As well as helping with flagging energy levels, Hill’s Science Diet dog food for senior dogs can also support muscle strength, keep joints mobile and nourish the skin, leaving your pooch with a youthful, shiny coat. A delicious mix of chicken meal, rice and barley, this will keep your pet looking forward to meal times and leave them feeling satisfied. No artificial colors, flavors or preservatives. Tantalize your old pooch’s taste buds with this delicious chicken meal dry food blend that can also help sharpen his mind as well as his body. Premium dog food company Purina has created a winning mix in its Smartblend Vibrant senior dog food that brings together quality chicken protein, animal fat and whole grains with added botanical oils to lubricate the body and nourish the canine skin and coat. The oils are also a natural source of glucosamine, which can support healthy joints and keep your senior pet on the move. Top it all off with a texture combination of meaty and crunchy and you also have a nice meal for dogs who may be starting to struggle with harder, dry foods. If you dog has severe allergies or an overly sensitive stomach, it’s worth just testing them on it first as there’s a lot of fiber and botanicals. Bringing together a trio of quality animal protein, plus whole grains, seeds, fruit and vegetables, Nutro Ultra is a nutrition-packed dog food for senior dogs that will have them licking clean their feed bowl. Nutro’s senior dog food is a carefully balanced blend that takes your pet’s culinary enjoyment into account as well as offering health boosting benefits. And we all know a taste-satisfied pooch is a happy pooch, whatever their age. And there are some serious superfoods in the bag, including coconut, kale and blueberries to put some serious sparkle into your older dog, including their brain, joints, digestion and overall physical condition. With no artificial ingredients, flavor or preservatives, this is great gourmet dry food for senior dogs that will keep them happy and healthy in more ways than one. If weight and reduced mobility is starting to affect your senior dog’s day-to-day routine, this well balanced dry dog food from Wellness Complete could be the dinner to perk him back up. One of the best senior dog foods available, Wellness Complete uses only natural ingredients to create a balanced daily diet to boost your ageing pooch. Its delicious formula keeps his hunger satisfied, helping to manage and maintain a healthy weight while the quality chicken protein can boost his energy and activity levels. And there’s a whole host of nutritional good stuff in there to help keep your senior pet in good working order, including glucosamine and chondroitin to help maintain hip and joint health and probiotics and good fats for a soothed digestion. The fiber count is balanced but just check if your dog is prone to serious skin allergies. If your dog prefers it wet or is having a little trouble chewing its usual dry food, then check out Hill’s Science Diet wet food for senior dogs. This balanced and tasty senior canned dog food has all the credentials of Hill’s dry mix but is a little kinder on ageing teeth and gums, without losing the nutritional quality. Made from premium-quality beef or chicken meal, with added vegetables and brown rice for a rich, stew-like meal, this canned senior dog food is also easy to digest and gentle on the stomach. It can also be mixed up with kibble for a crunchier texture. Fortified with vitamins, antioxidants and minerals, and rich in protein and good fats, this senior dog food will also help with muscle strength, joint health and condition of your pet’s coat and skin. A good nutritious wet food for the older dog to help keep him healthy, active and content. If your pooch has digestive issues or suffers from skin allergies and you think their dog food could be making it worse, then check out this grain-free dry dog food specifically formulated for senior pets. Wheat can irritate the stomach of older dogs or inflame skin conditions and for many senior canines, it can also be a little difficult to digest. Blue Buffalo has used deboned chicken, chicken and fish meal as the high-quality protein basis for this tasty kibble, with added fruit and vegetables, including sweet potato, tomatoes and blueberries to bump up the carb and nutrient quota. The result is a taste-dense dry food your senior dog will really enjoy without any upset. Plus, it is fortified with glucosamine and chondroitin for joint health, L-carnitine for stronger muscles and taurine for the heart. This is a wild-grade food that follows the principles of the canine omnivore diet to really help to boost the health and happiness of your older dog. For that stage in your dog’s life when only a wet food meal can really hit the spot, try this delicious canine-teeth and digestion friendly senior canned dog food from Wellness. Food enjoyment is key to your dog’s overall happiness and wellbeing but as a dog gets older their appetite and ability to chew and eat can dwindle. Wellness’ senior formula is designed to pique their interest and help to get their love of eating back. Calorie-managed but still packed with nutritional goodness, including premium chicken whole grains, fruit and vegetables, this is a tasty can of senior dog food to nutritionally support the health and wellbeing of your older pup. The wet food can also help with hydration and energy levels as well as the quality of your dog’s coat, digestion, eyesight, teeth and gums. To boost your pooch’s protein nutrition or to help him eat well if he has a problem with digestion, then you could consider the raw food route. Instinct Raw’s grain free dry dog food is good way to up the protein without losing the wider nutritional benefit of an all-round dry dog food. Using freeze dried raw chicken, combined with dry, grain-free kibble, senior dogs on Instinct Raw Boost could well be getting the best of both worlds. The protein is really good quality and the whole mix has been minimally processed so you can get all the goodness to your senior dog. Add in natural DHA for brain and eye health, glucosamine and chondroitin for hips and joints, natural probiotics and omegas as well as antioxidants for digestion, immune system and a healthy coat and this raw-mix for older canines packs a powerful nutrition punch. Your dog may have always preferred wet food to dry and with Nutro’s Ultra senior you get a super-tasty wet food that has been specifically formulated for the older dog. Made from natural and nutritious ingredients selected to boost and maintain the health of your senior pup, your dog does not have to compromise on taste just because he is getting older. The core protein is a trio of chicken, lamb and salmon, blended with an impressive range of 14 superfoods including sun-ripened fruits and vegetables and whole grains, bound together with sunflower oil and a rich, tasty gravy. 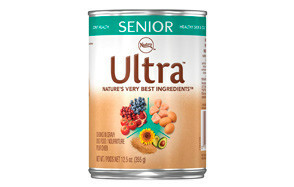 Although good for all dogs, the Ultra is a particularly good comfort food for the older spectrum who need soft food that they can easily digest without compromising on mood-boosting flavor. 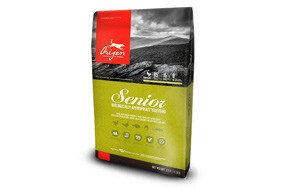 For when you are prepared to pay a little more for a quality food product to keep your best friend fed and happy, Orijen’s Senior Dry Dog Food is hard to beat. Grain-free so kind to canine tums, this premium protein dry food has been freeze-dried to lock in all the nutritional goodness of a raw food diet. Using chicken, turkey and fish pieces, boosted with egg then frozen and packed into bite-sized kibbles, your old guy will love to chomp down on this high-quality senior dog food. 85% meat, the remaining 15% is made up from wholesome fruit and veg for additional vitamins, antioxidants and minerals. The only addition is zinc and copper and the dry food’s low-carbohydrate, low-glycemic formula also supports healthy blood sugars. For the money you are getting a lot, not least a real superfood to keep your senior dog active and happy. Prevention, they say, is better than the cure and while you can’t turn the clock back for your ageing dog, you can help him to enjoy his later years in good health. Iams’ Proactive Health Senior Dog Food adopts the same principle, putting together a well-thought out dry mix that can boost your pooch’s immune system and strengthen him against the wear and tear of getting old. Easily digestible and with a good blend of fiber and prebiotics to keep his tum settled and happy, this dog food for senior dogs also included quality chicken protein plus a nice range of fruit and veg. Add in L-carnitine, glucosamine and chondroitin sulfate plus extra vitamins and minerals and you have a low calorie, tasty meal to help manage and limit those first signs of canine ageing. If your older dog is turning into a bit of a sensitive soul, then try this stomach-friendly grain free dry dog food from Canidae. Just because your senior pooch has digestive problems, doesn’t mean they have to be consigned to a later life of bland food and simple meals, as Candidae can show. Their dry dog food for senior dogs packs a delicious taste experience using chicken and turkey protein, mixed with whole ingredients such as sweet potato, peas, lentil and chickpeas for a calm and happy stomach. No corn, wheat or soy – all irritants that can inflame your dog’s ageing digestion. Probiotics have also been added to every kibble after cooking to help support healthy digestion, antioxidants for a healthy immune system, and omega 3 and 6 plus fatty acids to help support their skin and coat. And, as it is flavor-packed, your pooch really won’t know any difference, he’ll just chow down, happy. If your senior dog has become a fussy eater, is off his food or you just want to give him a taste-packed treat, then this slow simmered chicken and rice wet dish from Cesar is going to be a real pick up. Specially formulated for the older canine, and with a consistency that also works well if they are struggling to chew their food, you’ll be giving them some top-notch nutrition in an easy to serve portion. To your precious pooch, this will taste as good as it looks. A good quality chicken protein, with palatable rice and a tasty gravy, there is also more to this senior dog dish than meets the eye. Enhanced with vitamins and minerals and with a good water content for added hydration, this is a quick and simple way to ensure your older dog is getting the core nutrition they need in a way that they can comfortably eat it. Who knew the power of the avocado when it comes to boosting the diet of a senior dog? AvoDerm it seems, who have made the green fruit a key element of their Advanced Senior Health dog food. This premium grain-free dry dog food focuses on keeping the older dog active and replenishing their nutrients and energy levels, using quality protein and a host of superfoods to help that happen. With a lamb and chicken meal formula, these flavorsome kibble bits have a host of health and nutritional benefits for your senior canine buddy. The avocado is omega-packed for a healthy immune system, eyes, skin and coat while vegetables, alfalfa and flaxseed provide vitamins, minerals, antioxidants and essential fatty acids. Plus, there’s natural chondroitin and glucosamine to take care of your dog’s hips and joints. A great, nutrient-packed all-round dog food for the senior dog to help keep him at his very best. Your senior dog will still need protein as they get older, but make sure it is from a good meat source. A good quality protein in his dog food will help him to maintain healthy muscles and protect against atrophy, or muscle wasting, as he ages. Protein is also essential for organ health and immune function. Make sure you read the label on your chosen senior dog food to be sure of the protein source – looks for the words ‘chicken meal’ or ‘beef meal’, instead of more generalized or vague terms such as ‘poultry’ or ‘meat meal’. For some older dogs, some extra fiber in their meals can help with age-onset constipation as a result of a slower digestive system. Many senior dog food products will include higher amounts – 3-5% - of fiber and wheat bran is a good source, if your dog is not irritated by it. There is no real harm in choosing a senior dog food that has added supplements as they may have some additional health benefits for your pooch. Look for joint supplements such as chondroitin and glucosamine, plus omega 3 (can reduce inflammation) and antioxidants (to counter the effects of ageing). It’s important however, if your pet is known to need extra supplements, that you do not rely on your dog food alone, as the levels are lower than an actual supplement specifically for your dog. Higher levels of salt are not necessarily the best for your older dog, especially if they have problems with their kidneys, which is a common complaint for senior canines. As your dog ages, he will need less calories to support what will become a less active lifestyle. Older dogs can also be prone to putting on weight, so by managing his calorie intake, you can keep his weight at a good level and not putting extra strain on his joints. However, some older dogs may lose condition and could need extra calorific support. If in any doubt about the amount you should be feeding your precious older pooch, speak to your vet. Older dogs can start having problems with their own canines as their teeth and gums age, leading to eating problems or even a loss of appetite. 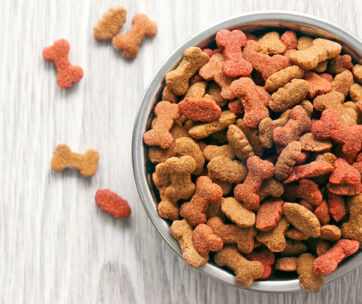 To help them get their eating mojo back, you should look at feeding them softer dog food or a mix instead of the harder kibble. Your dog does not naturally have a sweet tooth so any dog food that has been sweetened to improve the taste should be avoided. 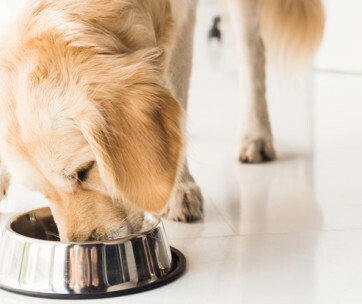 Corn syrup is a common sweetener added which can actually be addictive for your pooch, as well as adding hidden calories – not good if you are trying to keep his weight down. Sweeteners can also be harmful to older dogs who have diabetes. You should try and buy senior dog food that is as natural and unprocessed as possible, so be wary of any products with a long list of artificial preservatives. Any added color is there for one reason only, to make the food in the bowl look good. It has no nutritional value and I don’t know about you, but my 10-year-old Beagle really doesn’t care what her food looks like! Some dog food for older dogs can be padded out with bulking agents that add no nutritional benefit to the food other than boosting texture and taste. 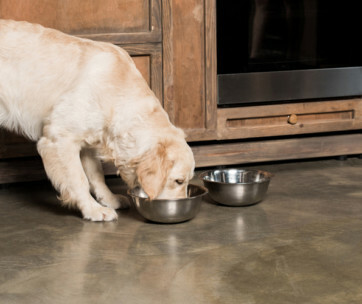 One common bulker, bone meal, can actually cause issues in older dogs as it adds phosphorus to the meal (which you need to keep low), or is of poor quality and can irritate their sluggish digestive system. There is some debate around the issue of a raw food diet for dogs, especially whether it can be beneficial for older animals. On paper it looks interesting – food as near to a natural state as you can get for your pet, with all the benefits it can bring. But when it comes to moving your older dog to just raw meat, you need to think carefully and ideally seek veterinary advice. Yes, it is a purer form of food that you can be more confident about its quality and origin and it can be easier on an older digestive system than other processed dog food options. But your ageing pet needs more than just pure protein to keep healthy and maintain a balanced diet – fiber, carbs, good fats - which they won’t be able to get from raw meat alone. Too much protein could also be problematic for dogs who have problems with their liver or kidneys so it can actually do more harm than good. 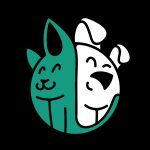 There is certainly nothing wrong in cooking up a nice bit of chicken as a temporary measure if your dog is poorly or off its food, but for a more permanent raw food swap, why not have a chat with your vet. Q: What is considered a senior dog? A: It does depend on the breed and health of the dog in question. Smaller dogs age more slowly after they reach maturity so a chihuahua for example, wouldn’t necessarily be considered a ‘senior’ until around the age of 10, whereas a larger animal such as a Great Dane would be classed as senior from around six or seven. As a general guide, most vets consider a pooch of seven or eight years or older to be a senior. Q: What age should you switch to senior dog food? A: Although once your pup has passed his half-life mark, it is reasonable to consider him as a senior dog, it doesn’t necessarily mean you then automatically switch to a specific senior dog food to match. His health, his activity and energy levels and his weight (high or low) should also be factored into the equation. If he is healthy and happy on the food he already has, you shouldn’t rush to change unless you feel he would benefit from additional support. A good time to consider a switch would be around the eight-year mark unless he is already starting to show the signs of ageing. Q: Can I give my older dog puppy food? A: A young pup that’s still growing and developing will have certain nutritional requirements that are different to an adult animal that is heading towards its later years so feeding your senior dog puppy food is really not a good idea. As a one-off if it’s the only dog food in the cupboard is fine, but it’s not really the best habit for your senior dog to get into. Q: How often should I feed my senior dog? A: Unless advised otherwise by your veterinary professional, twice a day – once in the morning and once in the evening – should be sufficient for your older dog. As a senior, there’s a good chance his daily activity levels are lower than a younger pup, so be careful with the portion control so you don’t overfeed and potentially contribute to obesity issues. You can also add in some nice healthy treats but make sure they don’t add up to more than 10% of your dog’s daily calorie allowance. A chat with your vet if you’re unsure will help you give the right daily food allowance for your pet, based on his age and health. Our top pick of best senior dog foods is this well-balanced dry food from Blue Buffalo that will effectively support your dog throughout its later years. Easy to digest and calorie managed, this is a great regular meal for your older dog that supports their immune system and helps to manage their weight, without losing any of its taste appeal. A flavorful dinner and a nutritious way to support canine health, we say that’s both a happy pooch and owner!